I was chatting with an old Apple friend. How old? We worked together over 30 years ago. Catching up he said he heard that John Medica had passed away. I found a Remembrance here at Wake Forest University site. Another more personal post is here. Upon reflection, what I remember most about John is not his accomplishments in the technology space at Dell (which were enormous), but the plaintive fact is that he was just a kind and good person. Full stop. When you met John, you instantly wanted to be his friend and you wanted to hang around with him. I was lucky to work with John when he was Apple as the project leader for the Mac II, taking numerous trips to Japan and Hong Kong with him and the other analog team members who worked on power supplies and monitors. I was amazed that John would go with us so often, but he knew those analog devices had to get done to ship the Mac II. 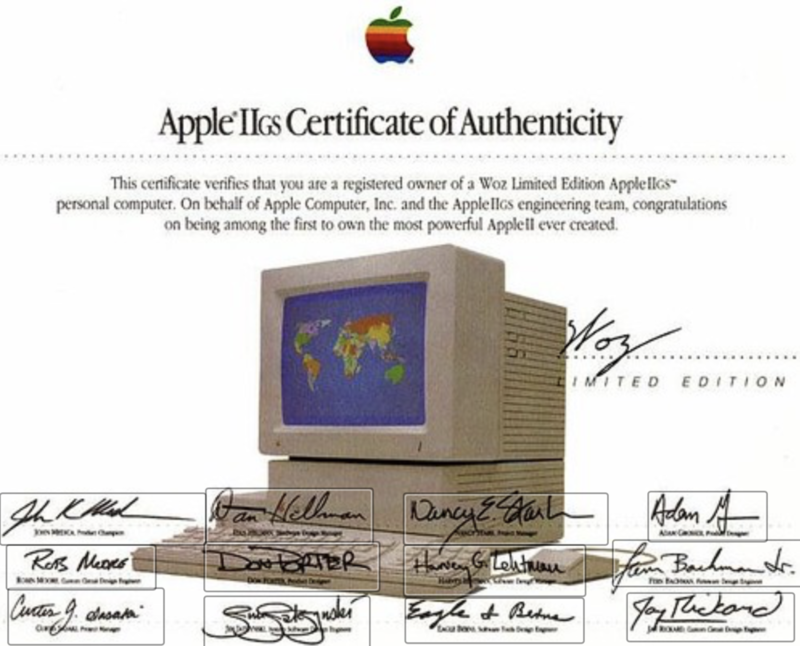 John’s signature as Project Champion on the Apple IIGS is on this certificate at upper left. First person to sign. After Woz. When John went to Dell and I was at Microsoft I would keep in touch with John and sometimes visit him when he was working in Dell Japan and I had trips to Japan visiting the MSKK office. Working at Apple Sheila Brady and John Medica were two people who I learned so much on how to run a large project. John was so passionate about his work, and he deserved a long retirement after all his hard work. It is so sad that at 59 he left us on Oct 13, 2017. Sorry I missed the news of his passing.